These breakfast cookies are great for a busy morning on the go, or any time of the day! These healthy and delicious cookies are oil-free, sugar-free and the recipe has a gluten-free option too. They are made with nutty hemp hearts, oats, cinnamon and vanilla, and they are naturally sweetened with dates. The addition of hemp provides a wonderful source of plant-based protein and the perfect balance of omega fats. I have teamed up with Manitoba Harvest Hemp Foods to bring you this easy-to-make recipe, as well as some meal-time inspiration on how to enjoy hemp hearts in a variety of ways throughout the day! Make my Oatmeal Raisin + Hemp Breakfast Cookies for an easy grab and go breakfast, or enjoy them any time of the day! So were do you get your protein? One of the most popular concerns surrounding veganism seems to be the question of protein. I have noticed that people are genuinely concerned with getting enough protein. This question stems in part from clever marketing campaigns by the meat, egg and dairy industries, that have drilled the notion into the public consciousness that animal products are the only sources of protein. The truth is that plant foods contain protein and that every nutrient that our bodies need can be found in the plant world - the animals are just the "middle-men/women"! With the abundance of whole foods available on the market we simply do not need animals to act as the "middle-man" in order to get our protein, or any other nutrient for that matter. Whenever I’m asked about protein as a vegan, I always use the example of hemp hearts as an excellent source of protein because they contain 24g of protein in every 1/2 cup! Not only do hemp hearts taste delicious (they have a mild nutty flavour), but they are also easy to use and incredibly versatile. I always add hemp hearts to my daily smoothies and I love using it as a topping on avocado toast, salads, soups and pasta. In addition to being an excellent plant-based source of protein, hemp is full of healthful essential fatty acids, with the ideal balance between omegas 3 & 6. What I love about Manitoba Harvest hemp foods is that they pack a nutritional punch! Their hemp products, made from the hemp seed, are high in protein and healthy fats. In fact, compared to chia and flax seeds, hemp seeds contain twice the amount of protein. 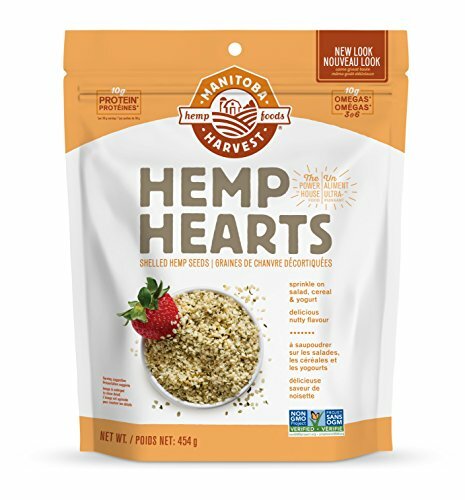 Hemp Hearts are also super delicious and versatile and are the next superfood to watch! There are so many reasons to embrace hemp foods, everything from the fact that they offer a sustainable farming solution, to health benefits, to great taste and versatility. I eat oatmeal almost every day and it never seems to get old. The topping combinations are virtually endless, and I always love adding hemp hearts on top. Check out my recipe for Quick + Easy Vegan Oatmeal (Refined Sugar-Free + Oil-Free + Gluten-Free Option)! Smoothie bowls are an easy to make meal that you can enjoy any time of the day! I made this green beauty with spirulina powder, Manitoba Harvest Hemp Foods hemp heats, chia seeds, fresh baby spinach and spring water, then topped it with Koukla Delights Mini Cacao + Matcha Tea Macaroons, fruit and more hemp hearts. Topping soups with hemp is always a good idea! I sprinkled a couple of tablespoons of Manitoba Harvest Hemp Foods Organic Hemp on my Sweet Kabocha Squash Soup. Make sure to visit Manitoba Harvest's website to get even more recipe ideas for using hemp hearts! Also, I'd love to see if you make and share any of my recipe ideas above - tag @lovewildlivefree on social media, so that I can see your creations! Why I love Manitoba Harvest! Over the years the Manitoba Harvest founders’ vision has remained unchanged - to foster positive change for community and the environment. The Manitoba Harvest team takes a hands-on approach and is in the fields educating farmers and encouraging more hemp acres. They also work to proactively spread the word about hemp foods to all those that will listen, sharing over 2 million sample packages per year to hemp fans young and old all across North America. To learn more about Manitoba Harvest Hemp Foods check out their website! Oil-free and sugar-free with a gluten-free option. 1. Preheat your oven 375 F and line 2 cookie sheets with unbleached parchment paper. 2. Make your flax egg: in a small bowl combine 1 tbsp ground flax and 3 tbsp water. Allow to stand for 10 minutes. 3. In a medium size mixing bowl, combine your dry ingredients. 4. In a small mixing bowl mash the dates into a paste. Note: if your dates are not soft, soak them in warm water for 15 minutes, or until they are softened. Add in the remaining wet ingredients and stir to combine. Alternatively, if you have a mini food processor process all of the wet ingredients in there. 5. Add the wet ingredients to your dry ingredients and combine. Fold in the raisins. 6. Scoop cookie dough onto a baking sheet, about 2 tbsp per cookie, placed about 1 inch apart. I used this 2-Tablespoon mechanical cookie scoop by Cake Boss. 7. Bake for 12-15 minutes, or until the bottoms are golden brown. 8. Allow to cool and store in an airtight container. Click here for contest details and to enter to win! Contest closes Wednesday, December 6/17 @8pm EST. Make sure you're following @lovewildlivefree on Instagram so that you don't miss out on this exciting giveaway! Don't forget to check out Manitoba Harvest on Facebook, Instagram, Twitter, Pinterest and Website. This post was in collaboration with Manitoba Harvest and the product used were kindly gifted for review. I only share products that I personally use and that are made with the highest integrity. Compensation was provided by Manitoba Harvest. The opinions expressed herein are those of the author and are not indicative of the opinions of Manitoba Harvest. The Amazon links provided are affiliate links, which means that if you visit Amazon through these links and purchase product, I’ll get a commission. Don’t worry – the price doesn't increase if you use my link - you'll receive a discount, while helping to support the free content that I share. * "B Corporation." What Are B Corps? N.p., n.d. Web. 19 Nov. 2015.